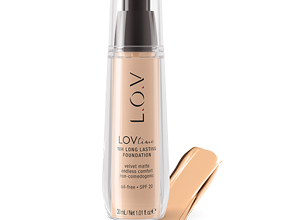 A foundation that’s lightweight and stays on. Oil-free texture enrichedd with hyaluronic filling spheres for smooth and matt results. Offers medium coverage and lasts up to 18 hours. With SPF 20. I spotted this brand in the Dischem store and put it on my list to try out, but luckily for me BSA made it happen. The bottle claimed that it has an 18H wear-time, oil- free, spf 20, endless comfort, non-comedogenic and velvet matte finish. Now that’s a lot of claims for a foundation! Putting the claims to the test I applied one pump of the product to my face evenly and blended it out with my kabuki brush. The first thing to note is that it is not a full coverage foundation but a light to medium coverage foundation. My freckles were still visible after one layer and I’m sure if another layer was to be added, the freckles could be covered. The foundation blended out smoothly and was pigmented. It felt as if I was wearing nothing on my skin and dried down perfectly to a matte velvet as it claimed. I was definitely impressed! Now I’m the type of girl who goes to the beach and wears makeup (yes I see you judging), and after applying the foundation I went straight to the beach for a good few hours. I tested this foundation to its limit! After a good few hours I came home and what do you know… my foundation was still intact, matte, and did not crease even though I had not set it with powder. Now that’s some amazing long wear foundation which I was highly impressed with!